The Cape Town Stadium is a stadium is a world class stadium. It is located in Cape Town, South Africa. This Stadium has been specially constructed for the FIFA World Cup 2010. Another stadium existed on the same site called “The Green Point Stadium” which has been demolished for the construction of the new stadium. Since the stadium on that site has been known as Green Point Stadium for a long time, so this name is also used frequently in during World Cup media coverage. It has a capacity to accommodate 69,070 people during the World Cup. The stadium is connected to the waterfront by a new road connection, Granger Bay Boulevard, and is surrounded by a 60 hectare urban park. Why was Green Point Stadium Demolished? 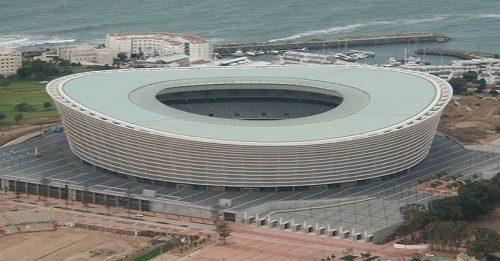 The Green Point Stadium had a seating capacity of 18,000 people. After partially demolishing the stadium, it replaces a portion of the Metropolitan Golf Club site which has now been realigned. Since the seating capacity is insufficient for a when hosting FIFA World Cup Matches, construction of a larger stadium was proposed. Green Point Stadium was a multi-purpose Stadium mainly used for football matches, and was the home ground of Santos Football Club and Ajax Cape Town at different points. It also hosted music concerts including Michael Jackson, U2, Metallica, Paul Simon, Robbie Williams, the Coca Cola Colab Massive Mix and the 2003 46664 Concert for the benefit of AIDS victims. The Construction of the Cape Town Stadium, located on the Green Point Common began in March 2007. In 33 months, joint contractors Murray & Roberts and WBHO completed the project at a cost of R4.4billion – or approximately US$600million. The project architects were an association between GMP Architects of Germany and two local firms, Louis Karol and Associates and Point Architects. The stadium is pretty huge and has 750 rooms and 3,000 doors. About 2,500 construction workers were employed in the building of the stadium and 1,200 artisans received training from the contractors. The completion of the construction of the Stadium was the top priority because of the FIFA World Cup Matches in 2010. The Exterior facade of the Stadium has a special noise reducing cladding. The Green Point Common, on which the stadium was built, was originally much larger than what now remains, and included most of the land between the sea and Signal Hill, stretching from the city centre towards Sea Point. The Project was completed in December 2009. The Stadium is a fifteen-story structure which has features such as curved walls clad in a translucent fabric mesh made from woven fibreglass coated with Teflon, The filigree skin changes its appearance with the movement of the sun, appearing blue at noon, rose in the late afternoon and red at sunset. On stormy days, it can appear silver, grey or even pewter. The Stadium Design Concept is incredible and has inspired Architects round the Globe. The interesting part of this design is that the internal design cooperates with the external facade Design. This concept of Interrelating the Interior Functionality with the Exterior Appearance of the Complex has been lost but Architects have tried to revive the lost concept and bring it into reality. The stadium also features 360 internal lamps, which lend a transparent gleaming appearance to the outer filigree skin, revealing its interior when switched on. The Stadium will be operated such that it remains a sustainable multi-purpose venue after the 2010 FIFA World Cup. The consortium, called Business Venture Investments 1317, will be expected to be involved in the management of the stadium from January 2009 onwards. The seating arrangement of the Stadium is incredibly flexible. After the World Cup is over, the stadium capacity will be reduced to 55,000, enabling it to cater for all types of sports, including rugby, as well as music concerts and other major events. The stadium will feature corporate hospitality suites, medical, training, conferencing and banqueting facilities.